A social media strategy for an organization is either incomplete or obsolete if it doesn’t contain any competitive analysis. And among all the social media channels, twitter alone can tell you a lot about your competitors without any doubt. With the introduction of expanded tweets, now this possibility has been strengthened further. So, if your organization is into twitter and not doing any competitive analysis through it, you are doing it wrong. 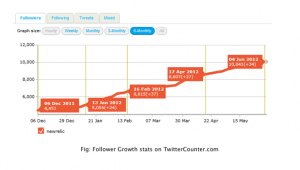 What to expect from a Twitter competitive analysis? Twitter is the best tool when it comes to apps developed on a platform. So, tracking and doing any analysis through/on twitter is further simplified when you know the exact app. 1. Handle: A twitter competitive analysis simply starts with locating your competitors out on twitter. And searching the twitter handle of your competitor is not a big deal; one can easily find it on their website or blog. 2. Presence: To track back the date when your competitor started on twitter Tweet Grader from Hubspot is the best tool. It also tells you about the #Hashtag that your competitor is using most frequently. 3. Niche/Topics depth: To find out the depth of the niche or topic that your competitors are up-to, track the hashtags (#) they are using. To search out the #tags, you may use a tool like tweet grader from Hubspot or ‘What the Trend’ – a wiki of hashtags. Apart from this #tag, consider using Klout. It will tell you in detail about the topics your competitor is influential about. 4. Growth over time: The best thing in a twitter competitive analysis is to track the progress of your competitor from its initial stages. And indeed this is one of the toughest parts if you don’t know the proper tools. To track the recent growth statistics, you can use a tool like TwitterCounter or TweetStats. And to track back the initial growth you may consider using Twitaholic which will take you back to your competitor’s initial stages (with no. of followers, following and tweets) on twitter. 5. Type of Content: The most important part of a competitive analysis on twitter is to find out the type of contents that your competitors are using on twitter. While doing so, the challenge lies in finding out the old contents from the early stages of twitter adaptation of your competitors. To lessen this ache use TweetScan. It searches back the old tweets as of from the first date your competitor was on tweeting. 6. Content Relevancy: To learn the content relevancy on twitter use TweetPsych. It presents a psychological list of traits to help you understand your competitor as per the niche concerned. 7. Frequency of updates: To know the frequency of updates, apart from the twitter handles, you may consider either TwitterCounter or TweetStats. 8. Level of Engagement: To learn the level of engagement on twitter, simply include a search term by your competitor’s name (or twitter handle) into your Hootsuite stream. You may also consider using a streamline tool like Monitter, just add the twitter handle of your competitor and there you are. To track it to the next level you can keep an eye on the RTs both inbound and outbound. Next big tool for your twitter competitive analysis is just inside the twitter itself, it is the Advanced Search. Switch to the advanced search https://twitter.com/#!/search-advanced and enjoy analyzing. There is a common misconception that a twitter competitive analysis only helps in building a twitter strategy for the one performing the analysis, whereas it can tell you a lot ranging from manufacturing to marketing. Keeping up-to-date with all the research, promotions and insider stories from your competitor are the possibilities to bank upon from a twitter competitive analysis.